Reading-based Pulleyn Transport, a 42,000 square foot, temperature-controlled warehousing operation specialising in the storage and transportation of frozen and chilled goods plus pharmaceutical and other products has installed warehouse performance system 'DeltaWMS' with RF scanning to enhance its 3PL offering for the company's 40+ customers. 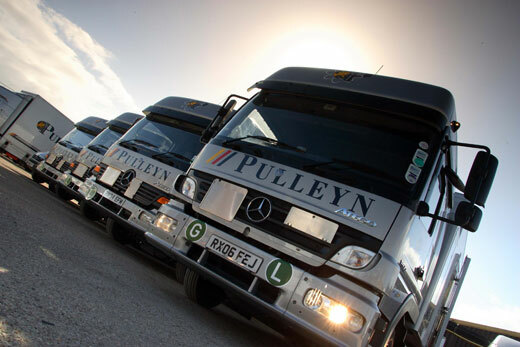 DeltaWMS is being integrated with Pulleyn's 'Sage Line 200' business system, allowing the company's wide range of customer invoices to be generated automatically. Commenting on Pulleyn's decision to invest in Delta, which follows a market-wide review of warehouse systems, Managing Director Ryan Pulleyn says: "We are investing in new facilities and better functionality for our customers. We liked Delta's interactive warehouse map, which is a fast and user friendly way to manage inventory in our complex, multi-customer environment. Barcoding, RF, invoicing integration and other new functions will allow us to optimise our operations for company and customer alike". "Third party supply chains are best served by warehouse performance systems that have been specifically designed for the highly customer-centric 3PL environment - from scratch" says Delta Software Managing Director Lance Bennett. "Delta's 3PL technology has been specifically developed to optimise 3PL processes". Delta's 'optimise my supply chain' solutions can be easily integrated with any ERP or other system: DeltaWMS systems have been developed for all types of warehouse operation including distribution, third party, manufacturing and bonded.